From the creator of Sanity Check comes an all-new adventure...in an all-new engine! VN Maker has just been released, and the stock assets are ready to prove they've got the same chops as their RPG predecessors! Enter Asset Club, an unusual extracurricular at which five students of DeFault Academy plan to make the best visual novel of all time. But can they work together? Do they know what makes for a compelling narrative? Will this game even...have a plot? This teaser will give you just a taste of the chaos of the full game, which promises four intertwining story paths with twelve possible outcomes, a dynamic affection system which makes your every choice (big or small) important, and secrets galore for those who take the time to fully explore every path! No installation needed! Just unzip the file and click the "Game" application to begin! 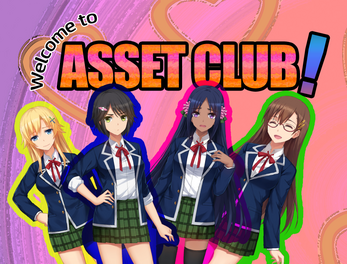 NEW TEASER: Welcome to Asset Club!